Summer is here. Well, not really. Summer officially starts on June 21st, and we are still in late May. But facts be damned, it is summer to me. Summer has a gateway, a mid point, and an end. We are in the gateway right now – Memorial Day Weekend. I don’t need to say what the midpoint and end of Summer are….you all get it. I won’t go into what Memorial Day means to the country on a macro level. Everybody is putting reminders out there of the real reason for the holiday. I agree and remember and am grateful, but I’m going to write about what the holiday and summer means to me, a civilian who was never in the military. I grew up on the coast of Southern California, in an area known as South Bay. The name is supposed to denote that you are within a few miles of the southern part of Santa Monica Bay. I’ve lived in four different cities that are part of South Bay…..but there has been no open land between them since long before I was born, so it all seems like different sections of the same city to me. Some people still call this area a suburb. I’ve lived in an area that is really a suburb, forty miles north-east of here. That has a completely different feel. It’s a bedroom community for most of the people that live there, because work is many miles away. Mile after mile of open land surrounds three sides. It’s on the edge of the LA Megatropolis. That is a suburb. South Bay is not that. South Bay has dense population, decent rapid transit (for the LA Area, that is), and all of the facilities that one would find in a major city. Work is usually within a few short miles. Not counting the ocean, there is no wilderness just a couple miles away. This is a nice area to live in because of the climate. Most people know that California is one of the handful of places in the world that has a Mediterranean climate. South Bay and some other small coastal sections of California have even milder weather than the rest of California. What does that mean? South Bay is often room temperature outside, with very low humidity. And while there is some difference between Winter, Spring, Summer, and Fall, these differences are largely muted along the coast. The point of this ramble…lack of distinct differences in weather here has driven a lot of people to mark the summer by it’s big weekends. But that isn’t all. Memorial Day and Labor Day are usually the portals marking the end of one school year and the beginning of the next. That’s probably even more important for me personally. I was extremely lucky growing up. My parents made sure that we did a lot of camping. We started this in about 1965-66, with Car Camping. Earliest trips were to Kern River and Lake San Antonio. While at Lake San Antonio, we had our first experiences with fishing. Bass fishing from shore. Lake San Antonio was a brand new lake at the time. I don’t know if it was really heavily stocked early on, or what, but you could cast out plastic worms from shore and catch decent sized bass very easily. We spent many an hour at the Harris Creek section of that lake. We saw that people with boats seemed to be catching even more fish, so on one of those early vacations at Lake San Antonio, we rented a pontoon boat. The day was largely a fiasco, because the outboard motor gave out. Before that happened, we had a great time. We pulled up next to the abundant brush that was really submerged trees and caught fish. Within a year of that event, Mom and Dad bit the bullet and bought a used boat. It was a mid-60s 16 foot Glaspar Tri Hull, with a new 65 HP Mercury outboard. We learned how to fish from that boat, and we also took up water skiing. Almost every time the Torrance schools had a long weekend, we were gone. In the earliest days, we were even out during part of the Christmas week, and always out during Easter week. But the real prime time was summer, and Memorial Day Weekend was the start of that. The family camping went on for years, even after I had married and left home in 1976. We graduated from campground camping, where you launch and retrieve your boat each day, to true boat camping at the Colorado River and it’s lakes. We would load the boat with camping gear, and find a nice cove to call our own for a week or two. That was my favorite type of camping. There were pitfalls along the way. Early in our boating time, my parents paid for a slip at Lake San Antonio. Launching and pulling in the boat every day was a chore. Having the boat in a slip was nice…we could just carry stuff down there, jump in, fire up the engine, and back away. During the night, somebody came to our boat, stole the Merc Outboard, and then pulled the drain plug. Most crooks are stupid. These crooks forgot to untie the boat. It didn’t sink all the way. Insurance covered everything, and we were back out before we even ran out of vacation time. We didn’t go all the way up to Lake San Antonio again, though. We went to nearby Lake Piru instead, and had one of the best fishing trips ever. There were a couple of days that we came in with limits of large-mouth bass for all five of the family. Cleaning 25 fish took a while. We were eating bass for weeks. Bass fried with Bisquick, and hash browns. Mmmmmm. Another pitfall happened in about 1970. We were getting ready to go on a two week trip to one of the Colorado River lakes – probably Lake Mead. On the evening before we were to leave, my dad was moving a bunch of stuff around, getting ready. He started to have chest pains. Mom took him to the hospital. He checked out OK, and the hospital said he could go home. My dad knew that something was wrong, and said he wanted to stay overnight. Mom went home. The next morning, she came to pick him up, and found out that he had a massive heart attack, and was in ICU, barely alive. He was only forty years old. He spent three weeks in ICU, and then another three months in the hospital. I’ve often thought about what would have happened had he not had the attach that night. He might have had a heart attack while camped on a remote shore at Lake Mead. If that had happened, he would probably be gone now. Instead, he is still alive in his late 80s. I remember thinking that the heart attack would stop my parents from the camping. If anything, they doubled down. 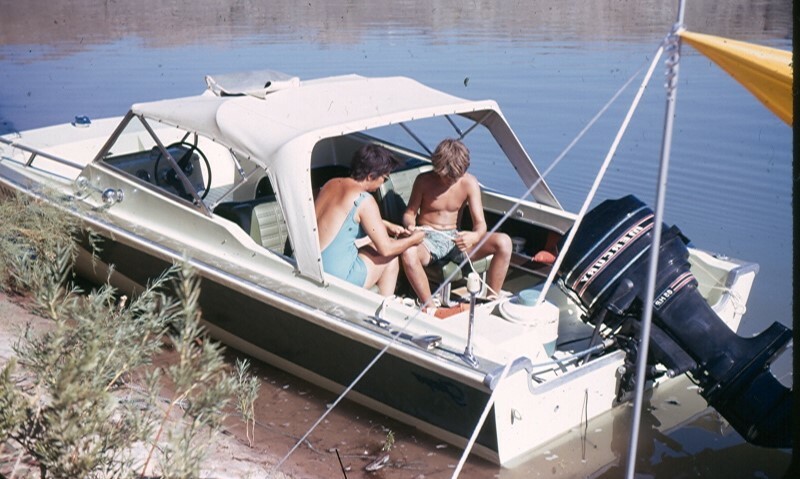 We got a new boat in about 1971 – a Tri Sonic. It had a 110 HP Merc engine, and thus was a lot faster than the old boat – just perfect for us kids who were getting better at water skiing. My brother and sister and I would often be allowed to take friends on the camping trips. My parents were very generous with that. I missed out on some of the mid-1970s trips. I was working part time by then, and could be left at home to fend for myself at that point. I was also at the age where my friends were more interesting to me than my family (everybody goes through that). I got married in 1976, and after that, my wife and I started going on the camping trips. It was great fun again. One trip that sticks out in my mind was a houseboat trip we took at Lake Powell, in spring 1981. That trip was the last time that I spent quality time with my brother Lew. He was killed in December, 1981 by a shark. That happened when he was surfing up in Monterey. I cherish the memory of that houseboat trip. Eventually my parents got a little too old for the rugged camping we had done all those years, so they bought a house in Bullhead City. They also bought a new boat – a nice Sea Ray with an I/O V-8 engine that would go over 50 mph. By that time my wife and I had several kids. We went out to Bullhead for vacation a couple times a year, but not as much as I would have liked. There were various reasons for that. I wish we could have been out there more. During most the time that my parents had the Bullhead City house, my wife and I were living in the suburb that I mentioned earlier. There were several lakes in our general area….Lake Piru, Lake Castaic, and Lake Pyramid. We were prosperous enough to have some extra spending money, so we bought our own boat….a Bayliner Classic 19. We had a lot of fun with that boat, but ran into problems too. The biggest problem was over-crowding at the local lakes. Some days, if you weren’t there far enough ahead of the sunshine, you weren’t getting on the water. That’s tough when you have four kids, the youngest being twins under 5 years old. We ended up using the boat more at Lake Mohave, by the Bullhead City house, than we ever used it locally. Boating is a chapter of my life that appears to be over at this point. I’m older now, and I have the urge to wander the land, so Laura and I are embarking on adventures in our Georgetown 328. I know that I’ll have a longing to be out on the water when we are camping at lakes. Such is life. One expensive toy is enough at this point. We are in the planning stages for our next RV trip now, and it is going to be at a lake. I’ll fish from shore and watch the boats and lounge around in the water and enjoy it as much as I did in earlier days. And I’ll remember camping trips from days gone by fondly.